I make a lot of pizza. Deep dish, grilled, french bread, “grandma,” you name it. But this might be the best yet. The crust, made with bread flour, is a near perfect combination of light with a tiny bit of crunchiness. 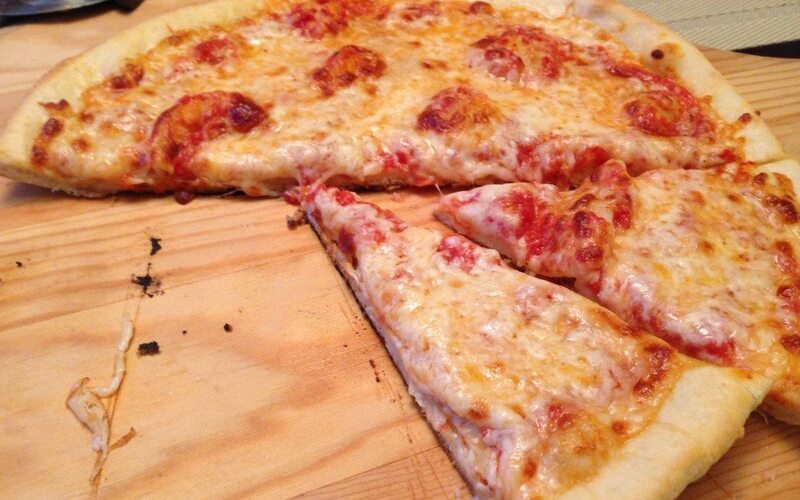 And although it may sound simple, getting the cheese right on a cheese pizza is not a no-brainer. If you’ve ever just plopped fistfuls of mozzarella on dough you know what I mean. It’s not that cheese and bread can ever really be bad but small tweaks can result in something much more interesting and nuanced. This recipe is 1 cup whole-milk mozzarella and just 2 tablespoons of parm and it’s a great blend. As great as all that was, my daughter and I both thought it was the sauce that made this so good. And all that is is canned tomatoes pulsed in the food processor with a little olive oil and garlic. Also, this was actually kind of fun to make. I had a little trouble getting the dough to the right consistency while it was in the food processor and had to add a couple more teaspoons of water to get it to be a bit sticky but cleaning the bow, as instructed. Once that’s done you just form into a ball and let rise for 1-1/2 to 2 hours. The pizza is first cooked stove top to get the bottom of the crust set and slightly blistered. After you roll it out into an 11″ round transfer to a skillet that has 2 tablespoons of olive oil in it. It helps to know your stove well here and I do not (yet) so mine got a little more than blistered. Check yours frequently. I used my All-Clad skillet but anything that can go in the oven will work (that is, nothing with a plastic handle). A cast iron pan would work really well too. Then it goes into a 500-degree oven for a few minutes to melt and brown the cheese. Then, you know, eat it. Well let it cool off a bit. Two questions- I use a cast iron pan and precook the dough in the oven but never get that Lou’s-like crispy edge. Are you saying I can use the stove top to get that highly sought after thin crunch? Have you tried quick rise yeast- I get my dough to rise in the 30 minutes it takes to get veggies cut, shred the cheese and make the sauce. Worth checking out.